If you’ve ever wondered why house bricks tend to be rectangular rather than, say, scalene triangles, our first advice to you would be to stop worrying about stuff like that. We’d then give you five minutes alone with Tsunde Tsumikiss to set your daft head straight. 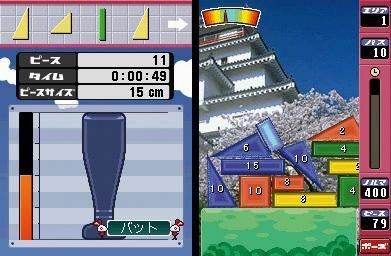 The object here is to stack objects as high as a given object - ranging in height fromdog-sized to Tokyo Tower - using a pile of random shapes that drop down from above in time-honoured Tetris fashion. Although you’re working against the clock, the time limit is fairly relaxed, and you’re free to rotate and place your shape at your leisure. If a particular shape repulses you, you can even chuck it off the screen, at the expense of a small time penalty. The brain-shriveling trickery comes in the shape of a balance meter; you need to fan out the base of your wibbly-wobbly tower as much as possible to ensure it can withstand the weight of blocks further up the construction, and it helps if you can group together shapes of the same colour as well, as that works as some kind of primitive multiplier. Tsunde Tsumikiss has its moments. Working under pressure, tossing a triangle in the air and catching it upside down in mid-air makes you feel no less than a god, and balancing a rectangle on top of a pair of triangle points is forehead-moistening stuff. It didn’t grab us completely, but if the concept appeals, it’s well worth the import. Description This is one of those learn-errific puzzle games that might make you fall in love with geometry, or inspire you to leap out a window. Thanks for the quandary, Japan.